Steinway & Sons pianos have long been considered the best pianos in the world, and while many people know this, not many people know why. Though every aspect of Steinway’s creation process contributes to the magnificence of its pianos, there are a few key features that stand out. As the first part of our new blog series, this post will talk about those especially significant characteristics and how each of them contributes to the whole. Want the best? Then use the best! Steinway & Sons, since its inception in 1853, has always had an extremely selective process when choosing the wood for its pianos. Much of a piano is constructed of wood, so selecting the finest available is essential to crafting the world’s best piano. Though many parts of a Steinway piano, including the action, are made of wood, the rim and soundboard are two of the most important. All Steinway pianos feature an inner and outer rim of hard rock maple bent together in one operation to form the foundation upon which is built the entire tonal component of the piano. This rim is capable of withstanding up to nearly 46,000 pounds of string tension while simultaneously maintaining structural integrity despite climatic extremes. A soft wood, such as those used in many other pianos, will absorb sound, whereas a hard wood such as hard rock maple reflects and projects sound, contributing to the uniquely brilliant tone of a Steinway piano. The heart of the wondrous Steinway sound emanates from a soundboard constructed exclusively of aged North American Sitka spruce, the largest and most valuable of the 35 spruce species that are available worldwide. Since 1853 Steinway has enjoyed long-standing historical relationships with lumberyards in the Pacific Northwest, Canada, and Alaska from which they have sourced this extraordinarily resonant wood. 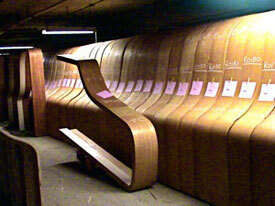 Every year Steinway inspects and selects each and every board to make sure it is of the highest quality prior to aging. When inspecting the wood, Steinway looks for a high ratio of growth rings per inch as well as a particular color that reveals internal consistency and optimal density within the individual tree. Numerous growth rings per inch are desirable as sound travels more efficiently within close-grained wood. 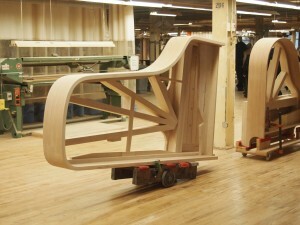 Once the wood is inspected and selected it is brought back to the Steinway factory in New York where it is further culled for soundboard use. Only about one to two percent of a premium tree is considered good enough to be shipped to Steinway, and only half of that wood proves fine enough for soundboard use. The soundboard and rim of a Steinway are integrally connected. Each Sitka spruce soundboard is custom-fitted to each Steinway hard rock maple rim for the greatest integrity of resonance and projection of sound. Only seasoned hard rock maple has been proven to project sound out of a piano without absorbing energy or compromising harmonic richness. Other woods simply do not accomplish this as efficiently. The Steinway sound is world renowned for its unrivaled beauty, harmonic wealth, and power. It is evident that the wood used in a piano is critical for tonal quality, stability and longevity. Steinway uses only the best available, incorporating it into an exclusive hand-crafted design that has resulted in a sound favored by 98% of the world’s leading concert pianists. How old is my Steinway? Copyright 2019 M. Steinert & Sons Pianos. 877-343-0662. Over 150 Years of Commitment. M. Steinert and Sons is the only authorized dealer of Steinway & Sons pianos in MA, NH, ME and RI.